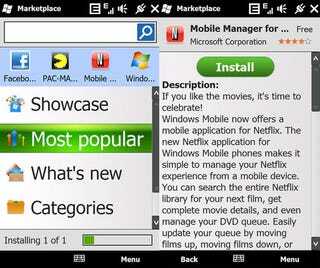 Windows Mobile 6.5's dirtiest secret is that all the good bits—the Marketplace, My Phone—work on all 6.x phones. Marketplace for 6.0 and 6.1 is officially slated for December, but with a dead-simple trick, you can download it now. Members at XDA, a cloistered online pit of despair where thousands of obsessed individuals diligently find, execute and post about literally every possible permutation of every conceivable Windows Mobile hack (side note: I love you guys), have ripped the Marketplace installer out of 6.5, and shared it with the world. The Marketplace itself could still use a few months to ripen, but it's far from terrible as is. The first version, a few days old and in stock form, is here—it seems to work for most folks. The second version's been fiddled with a bit, has been hacked so as to allow app installation on SD storage, which the Marketplace disables by default. Both are simple .CAB downloads, so all you've got to do is throw them on your handset and run them as installers.